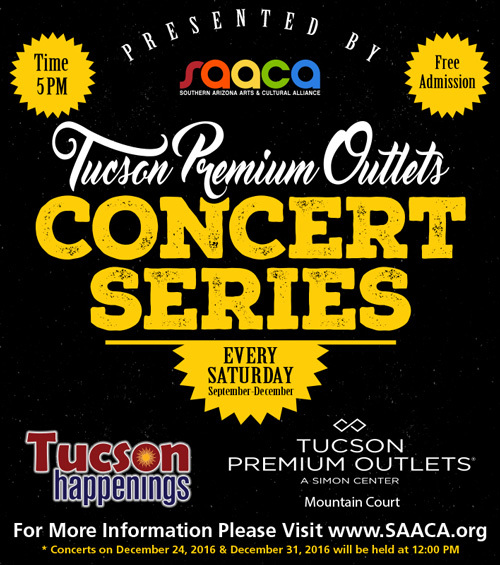 Southern Arizona Arts and Cultural Alliance and Tucson Premium Outlets present a series of free, family-friendly concerts! 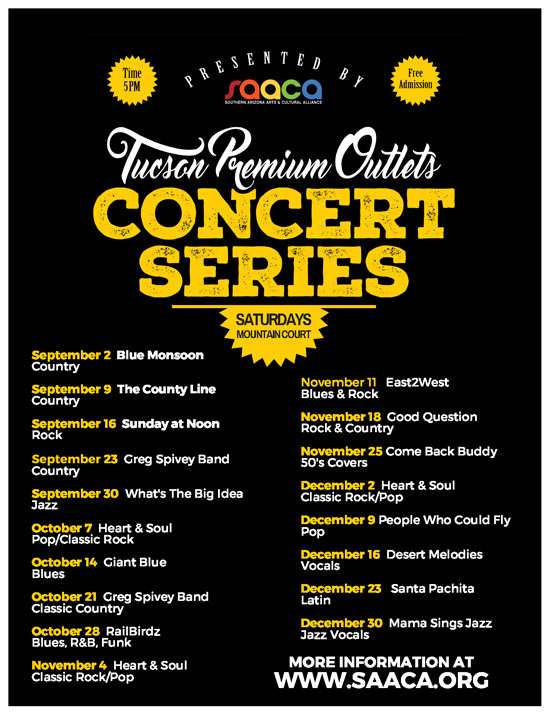 Enjoy the sounds of some of Southern Arizona's finest local musician's at Tucson Premium Outlets. The signature free concert series, held every Saturday evening, will feature a variety of weekly performances from local musicians and bands. Presented by Southern Arizona Arts and Cultural Alliance, the free weekly performances will take place Saturdays from 4 p.m. to 7 p.m. in the Mountain Court at Tucson Premium Outlets. Coupled with delicious food from Market Hall and over 70 stores offering extraordinary savings, the evenings provide the perfect outing for the whole family. "We are thrilled to welcome the community out to experience these live performances," said Elyse Munger, Director of Marketing and Business Development. "We have an excellent line-up of local talent, which is sure to make our first-ever Concert Series a weekly event the whole family will enjoy." The concerts are a creative collaboration between Tucson Premium Outlets and the Southern Arizona Arts and Cultural Alliance, bringing opportunities for local musicians to showcase their talents to the community, and the combination business and arts integration in new and creative ways. The concert series will feature 15 of Tucson's favorite bands playing Top 40's, Oldies, Jazz Standards, Rockabilly, Classic Rock and More! Some of the featured acts include Heart & Soul, Johnnie & The Rumblers, East2West, and Outlaw Rebels. The full lineup of performers is available at www.saaca.org . When: Weekly, Saturday Evenings 4 p.m. to 7p.m. For more information about programs and events produced by the Southern Arizona Arts and Cultural Alliance, go to www.saaca.org.